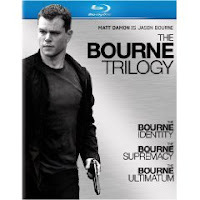 Amazon has a great offer on The Blu-Ray Bourne Trilogy (The Bourne Identity / The Bourne Supremacy / The Bourne Ultimatum) marked down from $119.98 to only $49.99 — with free super saver shipping! If you use your CashBack PayPhrase, you will even get 5% of your purchase price paid back to you in cash! This deal is good today only, December 18th. So, if you are interested at all, you better act quickly!